The Hindu Kush Himalayas (HKH) is an important repository of biodiversity and ecosystem services including water resources. However, the region has become increasingly vulnerable owing to the effects of climate change and poverty. To help address this challenge, the International Centre for Integrated Mountain Development (ICIMOD) has identified seven east-west ‘transboundary conservation landscapes’ across the HKH region (Figure 1). These transboundary landscape initiatives focus on promoting the ‘ecosystem approach’ advocated by the Convention on Biological Diversity (CBD) at the landscape level while improving the ecological resilience of communities living in these landscapes. One of the seven landscapes is the Kangchenjunga Landscape (KL) (landscape 5 in Figure 1), which is shared by Bhutan, India and Nepal and considered one of the most important transboundary landscapes in the eastern Himalayas. The Kangchenjunga Landscape Conservation and Development Initiative (KLCDI) was conceived in August 2012 during the First Regional Meeting in Gangtok, India, by representatives from participating countries, viz. Bhutan, India and Nepal. Over the last one and a half years, this initiative has progressed further through rigorous national and regional consultative processes aimed at developing country level Feasibility Assessment Reports (FAR) and Conservation and Development Strategies (CDS). The KLCDI is a transboundary landscape covering about 24,000 sq km. It encompasses the southern half of the area surrounding Mount Kangchenjunga and spreads across eastern Nepal; Darjeeling and parts of Jalpaiguri and Alipurduar of West Bengal, and the state of Sikkim in India; and south-western Bhutan – collectively referred to as the Kangchenjunga Landscape (KL). 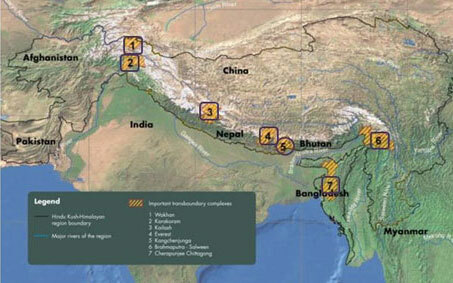 Figure 1: Map showing the seven transboundary landscapes in the HKH. The country FARs for KL-Bhutan, KL-India and KL-Nepal have been prepared and subsequently synthesized by ICIMOD into a Regional FAR for the Kangchenjunga Landscape. The CDSs have also been drafted at the country level and synthesized into a Regional CDS document. Taking into account the current delineated area of KL and the need for regional cooperation, as well as the opportunity for socioeconomic development at the landscape level, a Regional Cooperation Framework (RCF) was drafted as the basis for implementing the subsequent phases of the KLCDI. The objective of this third regional consultation workshop is to consolidate the preparatory phase of the KLCDI and apprise the country delegates of the outputs and content of the draft RCF and initiate the endorsement process for implementation. The major outputs of this regional workshop are finalization of implementation plans and agreement on the process for endorsement of the RCF for KLCDI. Providing KL country representatives a platform to present their implementation plans for achieving biodiversity conservation and sustainable development goals in the KL. This regional workshop will be attended by approximately 50 participants representing the governments, nodal institutions, major stakeholders and individuals from the KL member countries, as well as by key representatives from ADA, GIZ and ICIMOD.